Arsenal eyeing Barcelona striker Munir El Haddadi. Arsenal are eyeing Barcelona striker Munir El Haddadi. 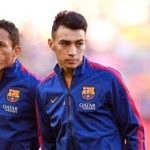 Fichajes.com reported that Arsene Wenger is pushing for a deal for 19-year-old Barcelona attacker Munir. The youngster has broken into the first team at the Nou Camp this season and has featured eight times for the Catalan club so far. He has not started a game for the last month though and he is now open to a move away from Barcelona and plans to hold talks with boss Luis Enrique.